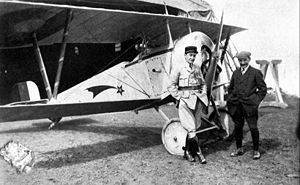 The Nieuport 11, often nicknamed the B�b�, was a French World War I single seat fighter aircraft, designed by Gustave Delage. It is famous as one of the aircraft that ended the 'Fokker Scourge' in 1916. The Nieuport 11 was basically a smaller, neater version of the Nieuport 10 - designed specifically as a single-seat fighter. Like the "10" the "11" was a sesquiplane, a biplane with a full-sized top wing with two spars, and a lower wing of much narrower chord and just one spar. A "Vee" interplane strut joined the lower wing with the broader upper wing on each side. The main drawback of this particular layout is that unless it is very strongly built, the narrow lower wing is prone to twist and bend under stress. This was a problem with all the "Vee-Strut" Nieuports, as well as the German Albatros D.III, V and Va, which adopted a generally similar wing design. Nieuport 11s were supplied to the A�ronautique Militaire, the Royal Naval Air Service, the Dutch air service, Belgium, Russia and Italy. 646 were license produced by the Italian Macchi company. Although its own operational career was short, it was the first in a line of single seat "Vee-Strut" Nieuport fighters - the most important being the Nieuport 17, 24bis. and 27. By March 1916 the B�b� was being replaced by the improved Nieuport 17. This type was in turn replaced by SPAD S.VII in most French squadrons early in 1917, and by the Royal Aircraft Factory S.E.5a in British squadrons later in the year. Thereafter the Nieuport single seat types were widely used as trainers. Nieuport 11 Single-seat fighter-scout biplane. The type was also known as the Nieuport Scout and Nieuport Bebe. Nieuport 16 Improved version. Single-seat fighter-scout biplane, powered by a 110 hp (92 kW) Le Rhone 9J rotary piston engine. Royal Thai Air Force operated four aircraft. Ukrainian Air Force operated one aircraft only.